Color(s): Lemon, liver, orange, black; in combination with white or solid-colored. Originating in England in 1650, the English Pointer was used to locate hare and upland birds. So named for their motionless stance they assume when they have found game, this breed continues to thrive as a popular hunting dog and companion. The English Pointer exhibits a proud and aristocratic demeanor. They possess an alert expression. English Pointer's are athletic, muscular, powerful, and are graceful and fluid in movement. An affectionate, loyal, and devoted breed, the English Pointer is responsive, congenial, and even-tempered. They get along with dogs and will do well with non-canine pets they have been raised with. They are good with children, although small children must be supervised. English Pointer's are reserved with strangers and will alert their family to suspicious noises and activity. Regular brushing with a firm bristle brush is recommended. Bathing should only be done when necessary. It is important to routinely check the ears and paw pads for debris. 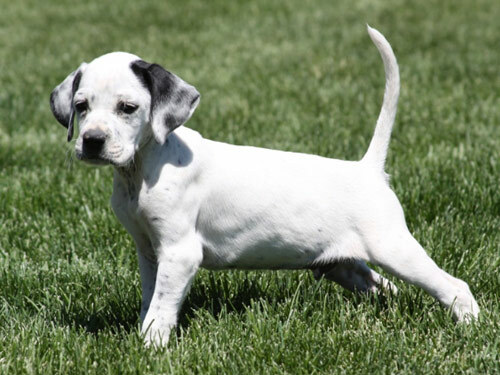 The English Pointer breed is prone to skin conditions, thyroid problems, hip dysplasia, and dwarfism. The coat of the English Pointer is smooth, dense, and short with a natural sheen. The English Pointer is easily distracted and willful. They are, however, intelligent. Early socialization and obedience is a must. Training sessions should be short and varied. They will not respond to harsh or heavy-handed methods. Training should be done with firmness, fairness, patience, and consistency. The English Pointer breed is not recommended for city or apartment living. They do best in a rural setting with acreage to roam and run. The English Pointer is highly energetic and requires daily vigorous exercise. They thrive on hunting, make excellent jogging companions, and excel at Pointing Field Trials.